Being diagnosed with breast cancer is an experience no one should have to go through. Should it happen to you, you should know that there are more options available than ever before. It is important to stay calm and have a thorough discussion with your doctor and oncologist about what to expect and what treatments are available for you. Take notes if necessary and bring along your partner or anyone else you are close to for support. They will have to go through the journey with you so it is important that they are there from the start. Although you will probably be feeling very low, you must take steps to look after yourself. Make sure that you get enough sleep, eat a good, clean healthy diet and get some exercise if you are able. Whatever you do, keep a positive mindset and don’t lock yourself away from those that can help you and talk to people when you’re feeling down. It’s important for you to be with people who care about you. Continue reading to learn more about some of the things you will need to know after a breast cancer diagnosis. What Happens After A Breast Cancer Diagnosis? After your diagnosis, it’s perfectly normal to have a lot of questions for your oncologist. The first things you should inquire about is what type of breast cancer you have, whether it has spread, and what stage the cancer is at. A lot of other thoughts will be going through your mind but be sure to start with the basics of your diagnosis. You should also highly consider getting a second opinion for treatment options. Other things to consider asking are: Will they be able to do a lumpectomy and save your breast or will you have to have a mastectomy? Can they do a reconstruction of the breast at the same time that the tumor is removed? Armed with the right information, you will be in a better state of mind to deal with the entire experience. You may be reluctant to ask a lot of questions; however, with more information you will feel more empowered. What to Eat After Breast Cancer Diagnosis? It’s not uncommon for your appetite to decrease after getting serious news like being told that you have breast cancer. However, it’s important to keep your energy levels up and to eat plenty of nutritious and healthy food. Try eating lots of protein, such as lean meat, fish, and eggs, as well as cheese, milk, yogurt, beans, and nuts. Eat plenty of fruit and vegetables, especially dark green vegetables like spinach, and citrus fruits. If you struggle to eat a full meal, try splitting your meals into five or six small meals. Be aware that there will be days when you really can’t face food. A good alternative for some people can be meal replacements, which will give you all the vitamins, and minerals you need. Be sure to speak with your doctor and/or your oncologist if you find yourself in this situation. What Treatments are Available for my Breast Cancer? What treatment you are going to have will be one of the first concerns for most women who are diagnosed with breast cancer. Will it be an operation, radiation, or chemotherapy? Perhaps you will be having all three at different stages of your treatment. Sometimes chemo is given before an operation to reduce the size of the tumor, but every situation is different so speak with your medical professionals before jumping to any conclusions. Chemotherapy can be very hard on some patients and may come with a lot of side effects which you need to be aware of; however, not everyone reacts the same way. Nausea is common, so it’s best to stick to dry foods like toast that are easier on your stomach. You may get mouth and throat problems, which mean that you need to eat soft food. Chemo can also affect your taste buds so be prepared to try new foods that might agree with you post-therapy. One of the things most women worry about most is hair loss. For many women, how you wear, style, and color your hair is an extension of your identity and the thought of any amount of balding is upsetting. However, there are ways to hide this, such as wigs, scarves, or hats when you go out. There are remedies for lost eyebrows, such as tattoos or microblading. Microblading is a semi-permanent make-up procedure which gives you beautiful eyebrows and lasts for around three years. For many patients the hair-loss is temporary, so don’t be discouraged and remember to always see your beautiful self. Although initially the future may seem bleak, it doesn’t need to be these days. There are plenty of therapy options that can help you and studies have shown even changing your diet can be a huge help. Adopt a positive outlook and surround yourself with people who care about you and who you can depend on. If you feel isolated, you might benefit from speaking with other women in a similar situation. 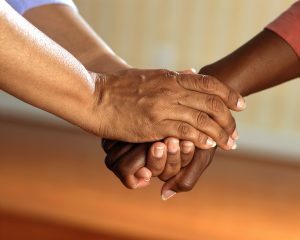 Consider joining a support group where you will be able to talk about your cancer openly. Remember, always look to the future, stay positive and fight! Early detection saves lives so be sure to schedule your annual mammogram with PINK!